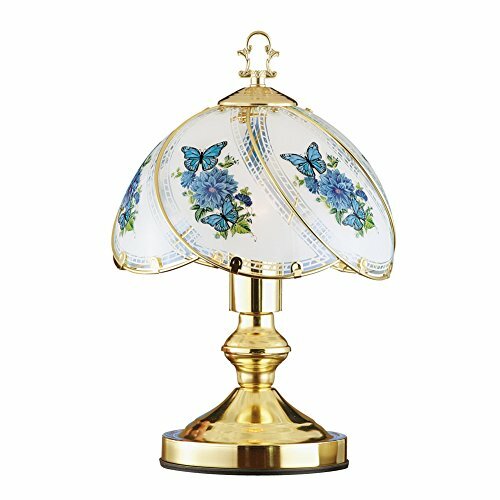 Brighten up your dcor with this unique lamp that features beautiful blue butterflies and flowers. The elegant design features gracefully sweeping glass panels atop a gold-toned, touch-sensitive base. Light has three brightness levels that are controlled simply by touching the base. Perfect for your desk or bedside table. One 40-watt bulb required (not incl.). Glass and iron. 9 1/4"Dia. x 13 3/4"H.
Brighten up your décor with this unique lamp that features beautiful blue butterflies and flowers. The elegant design features gracefully sweeping glass panels atop a gold-toned, touch-sensitive base. Light has three brightness levels that are controlled simply by touching the base. One 40-watt bulb required (not incl.). Glass and iron. Measures 9 1/4"Dia. x 13 3/4"H.